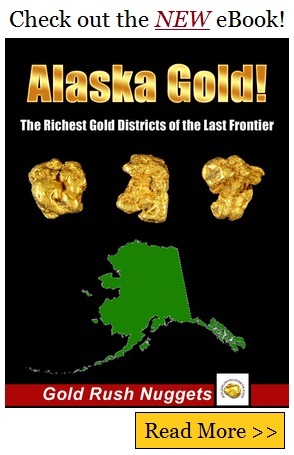 The discovery of gold near present day Fairbanks, Alaska was considered to be the last American gold rush. The gold of this area was not discovered until 1902. The story of the Fairbanks Gold Rush started with two men. Interestingly, a trading post was built along the Chena River near present day Fairbanks, prior to the discovery of any gold. A few years prior, the Klondike Gold Rush in the nearby Yukon Territory had lured thousands up men up to Alaska in search of riches. One of these men was Barnette, who intended to set up a trading post near Tanacross, Alaska to supply miners traveling to the Klondike. Many of the men venturing north took overland trails to the Klondike, but many including Barnette chose to take a ferry up the Yukon River to attempt the journey. Misfortune was encountered repeatedly, as low water conditions prevented the ferry from venturing up the Yukon. In an attempt to reach their destination, they ventured up the Chena River, believing that it may be a slough of the Yukon and a possible way around the low water. Within only a few short miles up the Chena River, another low water site was encountered. Fearing a treacherous downstream trip with a loaded down ferry, Barnette reluctantly chose to unload his supplies and set up his trading post at this location. At the same time, a man named Felix Pedro was already in the Tanana Valley, exploring the banks along the banks of the Chena River. He had recovered small amounts of gold, but on July 22. 1902, he struck rich paydirt. Pedro was quick to tell Barnette of his discovery. Barnette was quick to spread the word, knowing that a gold rush to the area would make him a lot of money by allowing him to supply the miners with goods. He hired a man named Jujyra Wada to travel to Dawson City and eventually on to the Klondike to spread the word that gold had been discovered along the banks of the Chena River. Excitement of the new gold strike traveled to the other Alaskan mining towns, and eventually reached the port towns of Seattle and San Francisco. Unfortunately for most of the men who traveled there, the richest placer grounds were claimed up before they ever made it to Alaska, and they instead were hired as laborers to work for Barnette on his gold claims. As with all gold rushes, the region around Fairbanks bustled with commerce for a few years. Miners worked the Chena River and nearby waters for gold, and while saloons, blacksmith shops, lumber mills, and supply posts stayed busy supplying the men with what they needed. Eventually, as the richest grounds were slowly worked out, miners vacated the area in search of other ventures. Barnette had become the mayor of the new city of Fairbanks, and later a banker. As the gold began to be depleted, the bank collapsed, and depositors blamed Barnette. In 1911, he quietly departed Alaska never to return again. No one knows for certain what happened to him after he left Fairbanks. Felix Pedro died in 1910, eight years after his initial discovery of gold at Chena River. Today, Fairbanks is a thriving city in Alaska, the second largest in the state. There is still a thriving mining industry in Fairbanks. With new equipment and mining technologies, much of the ground around the city can be profitably mined and continues to produce good amounts of gold even 100+ years after the original gold strike in the area.